A collaboration between various partners, the 2010 expedition to the Titanic wreck site produced the first comprehensive map of the 15-square-mile debris field. AUVs (autonomous underwater vehicles) and an ROV (remote operated vehicle) were used in conjunction to harness cutting-edge 2-D, 3-D and sonar technology. The first comprehensive map of the Titanic wreck site has been created as researchers pieced together some 130,000 photos taken by underwater robots in the depths of the North Atlantic Ocean. Resembling the moon's surface, the map shows debris and parts of the ship scattered across a 15 square-mile patch of ocean floor. The detailed images might provide new clues about what happened after the "unsinkable" luxury liner hit an iceberg and sank on April 15, 1912, killing more than 1,500 of the 2,200 passengers and crew on board. ANALYSIS: Did the Moon Conspire To Bring Down Titanic? "If we are going to do our best to manage the Titanic wreck site as a testament to those that sailed on her, we need to understand the disposition and physical state of what's there," Titanic expedition co-leader David Gallo, director of special projects at Woods Hole Oceanographic Institution in Falmouth, Mass., told Discovery News. "In addition, we need to put Titanic in context of it is natural setting on the deep Atlantic seafloor," Gallo said. Detail of the bow of the Titanic taken from a comprehensive map of the 3-by-5 mile debris field. When Titanic sank in the early hours of April 15, 1912, its stern and bow sections separated. The two pieces came to rest roughly 2,000 feet apart from one another on the ocean floor, 2.3 miles below the surface of the North Atlantic. 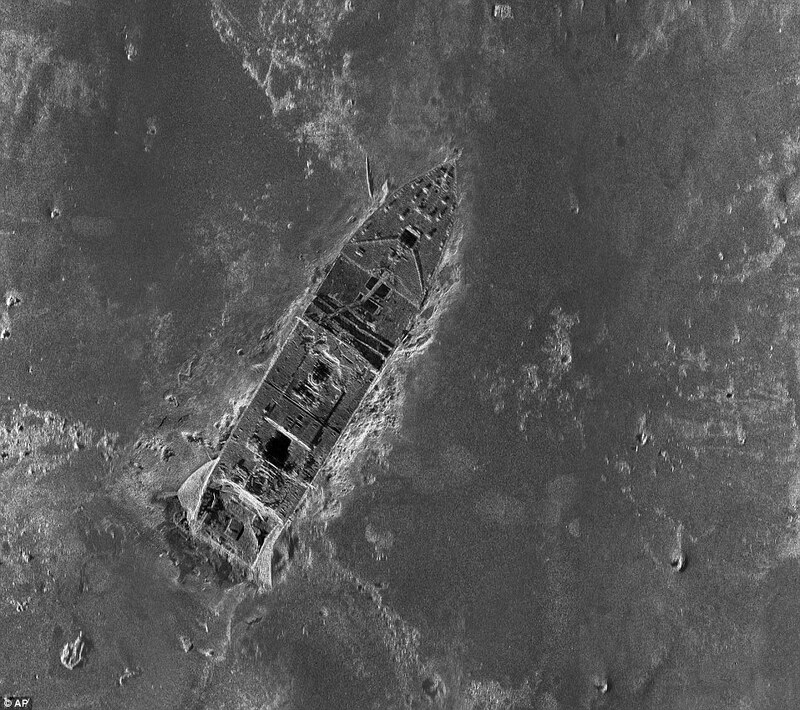 It's not the first time that the Titanic wreck site has been mapped. The first attempts began soon after the doomed liner was discovered in 1985. Explorers used photos taken with cameras aboard remotely controlled vehicles, which did not hazard too far from the bow and stern. Therefore, all the maps are incomplete, covering only fragmented portions of the wreck area. "As much as 40 percent of the wreck site has not been fully studied and documented, including multiple hull sections," RSM Titanic Inc, the legal custodian of the wreck, said on its website. The comprehensive survey map of the wreck site took place in the summer of 2010 as part of a project aimed at "virtually raising Titanic and preserving her legacy for all time." The expedition to the wreck was led by RMS Titanic Inc., the Woods Hole Oceanographic Institution and the Waitt Institute of La Jolla, California. They were joined by other groups, such as the National Oceanographic and Atmospheric Administration (NOAA), and cable TV's History channel. During the expedition, torpedo-shaped AUVs (autonomous underwater vehicles) surveyed the entire search area with high-resolution side-scan sonar. Pinpointed by the AUVs, the debris-rich sites were then explored by a ROV (remote operated vehicle) fitted with cameras. The resulting 130,000 high resolution photos were pieced together on a computer to provide a detailed photomosaic map of Titanic and the surrounding sea floor. "We are still processing some of the data but the elements of a 3D map are there," Gallo said. "The images are staggering. There you are on the bottom of the ocean, transported to the sea floor. It's mindboggling; even veterans who have been to Titanic numerous times are slack-jawed," he added. The wreck of the Titanic was found on Sept. 1, 1985 about 13 miles from the last position recorded before the ship sank on her maiden voyage from Southampton, England, to New York City and became a legend. A deep canyon carved out of the ocean floor lies some 3.5 nautical miles west of the wreck site -- had the ship landed there, she might never have been found. Because of the way the ship broke apart -- the stern and bow face opposite directions and are 1,970 feet apart from each other -- some areas in the 3-by-5-mile wreck field have a larger debris concentration. Debris abound in the so-called "hell's kitchen," an area of the seabed scattered with broken china, pots, pans other cooking tools. Another debris rich area is the "coal fields," which features a large quantity of the black combustible. Indeed, the Titanic left England carrying 6,000 tons of coal . According to RSM Titanic Inc, the "coal concentration in one area is believed to be due to both the coal's weight and how the ship broke apart." Other features on the mapped wreck site include a pile of rubble identified as "deckhouse debris," a 60-foott long chunk of the side of the ship, five of the ship's huge boilers, and pieces of the ship's bottom. "You really begin to understand how violently the ship tore itself apart when it went down and landed all over this enormous footprint on the bottom of the ocean," said David Alberg, Sanctuary superintendent for NOAA’s Monitor National Marine Sanctuary. The layout of the wreck site, where the pieces ended and how they are arranged and oriented on the ground, might help solve some of the remaining mysteries on how the Titanic broke apart and sank. For example, marks on the ocean floor to the west of the stern, with debris concentrated to the east, indicated that the stern rotated. The new findings will be detailed during a two-hour History channel documentary on April 15, exactly 100 years after the Titanic settled at the bottom of the North Atlantic. During the show, computer simulations will re-enact the sinking in reverse, bringing pieces of Titanic’s wreckage back to the surface and reassembling the ship in a virtual hangar.